My vision for the Astral-themed Ten of Cups is of a happy family – settlers on an Earth-like planet – gazing at a rainbow nebula in the night sky. The parents, knowing that humankind’s future lies in the stars, are eager to pass on to their children the love of science and space, the desire to explore the universe. A loving couple spend time with their children. 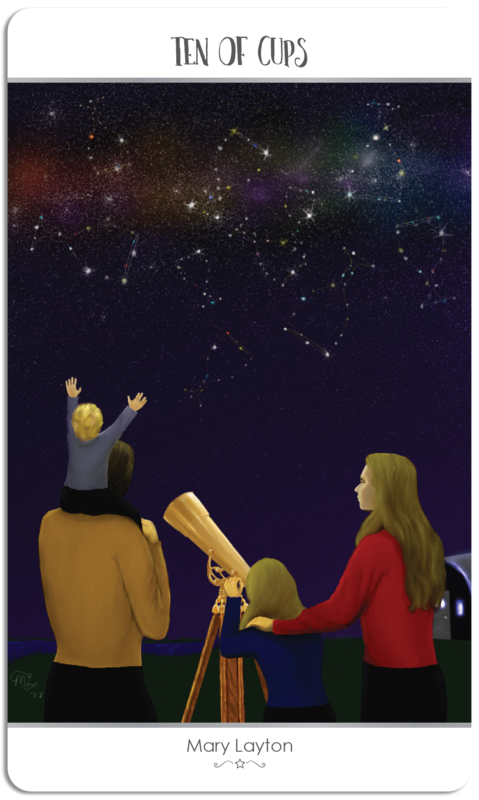 No homework, or housework await, just time and companionship, as they share their love of astronomy with their kids. The stars form constellations of ten twinkling cups high in the sky, as the family looks on in awe. Enjoyment of the simple pleasures, of nature and each other. When this card appears in a reading, it is a welcome sign, advising of happiness and security. It may not be all right in front of you yet, but the foundations have been laid, and you are loved, safe and protected. It won’t feel like it all the time, with occasional squabbles and fights, but that’s natural among loved ones. When and where these problems make themselves known, build bridges and restore harmony as quickly as possible, to restore that feeling of contentment. The outside world can be terrifying at times, even for experienced adults, but in your home, with those you call your family, you can feel secure, knowing that they have always got your back. No matter what happens. Especially during the rough patches in your life, make the time to spend a few minutes, or if possible hours, with your family (be they blood relatives, or the family you have chosen for yourself). Warm yourself in this unique joy and appreciate what you have – not in terms of material wealth, but in your family and relationships…intangible wealth that enriches your life every day. This entry was posted in Artist, Deck Review, Featured Card of the Day, General Tarot, Readings and tagged 10 of Cups, 78 Tarot, Astral, Tarot.